THE GLOW Charlotte is a family-friendly Halloween event featuring over 5,000 glowing hand-carved jack-o-lanterns. This kid-friendly event is the perfect way to celebrate the season in a not-too-scary way. Don’t miss even more fun things to do with kids in Charlotte. Here in Charlotte, fall doesn’t bring cooler temperatures. It is often mid-November when I realize fall is almost over and it never really “felt” right. A couple years ago, I got into the habit of marking my planner for putting up the Halloween decorations on October 1st even if it is 90 degrees outside! When I heard about THE GLOW coming to Charlotte, I thought it would make the perfect kick-start for our fall season this year. If we are going to have 90 degree days, at least we can take advantage of the warm weather to stroll along a jack-o-lantern path at night! No sweaters needed. So Friday night, we donned our most festive t-shirts and headed out to Concord to check things out. We had a great time, but our visit would definitely have been improved with a little more information. Here is everything we think you need to know about THE GLOW before you go! P.S. 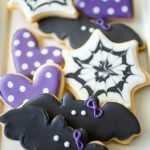 Looking for more fall family fun? Don’t miss our reader’s favorite fall ideas here. What is THE GLOW Charlotte? 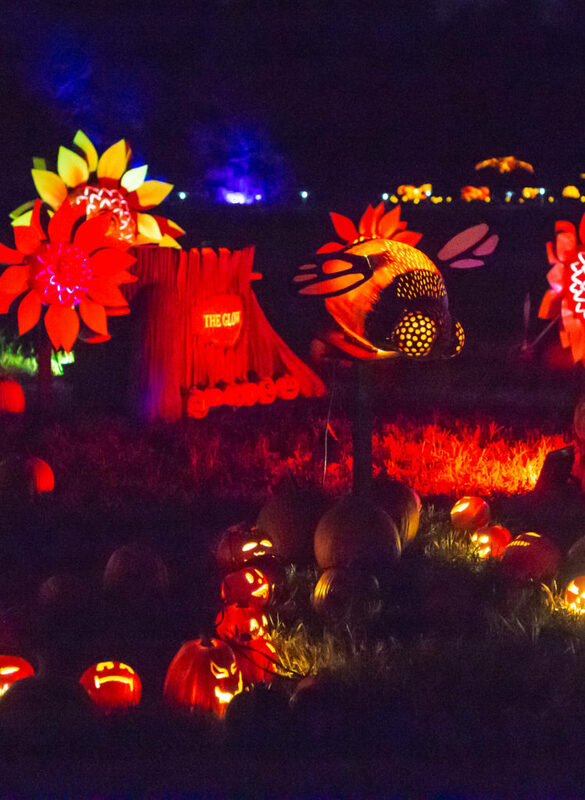 Talented pumpkin artists have hand-carved 5,000+ jack-o-lanterns and put them on display along a guided path for your family to stroll and view. 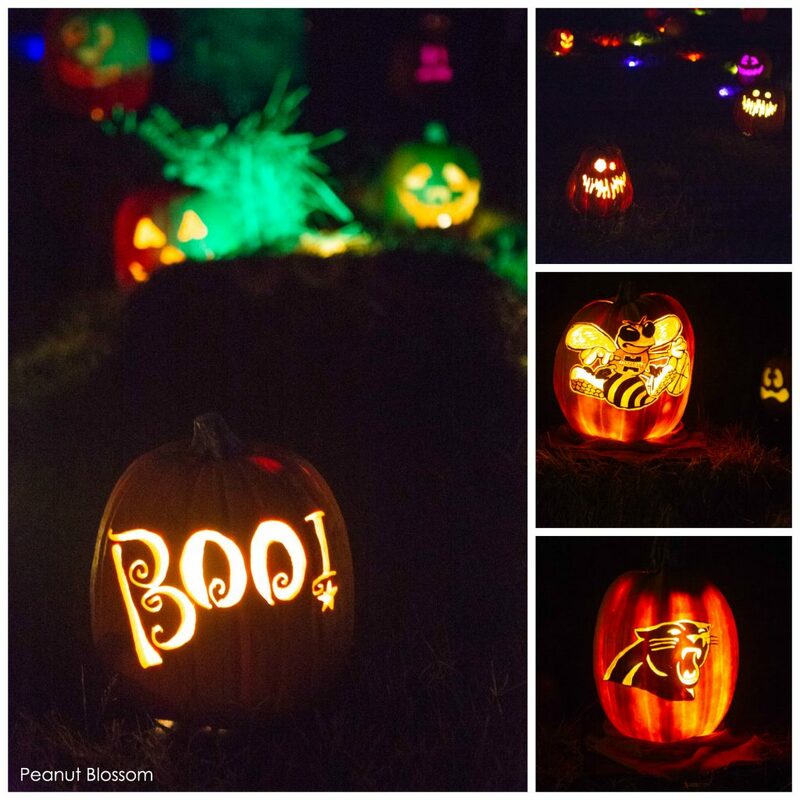 Many of the pumpkins feature local interest themes like the Panthers, the Hornets, and a NC license plate. There are themed stations all along the path: a pirate ship with the coolest jelly fish pumpkins I’ve ever seen, a dinosaur cluster, a bumble bee garden, Disney characters, a motorcycle parade, and more. The path starts out a little more creepy Halloween-y and then transitions into very safe kid-friendly displays. Music is piped in to match the ambiance. Where is THE GLOW Charlotte? We had the most trouble just finding THE GLOW. Their web site says it is at the Charlotte Motor Speedway but the address they posted is incorrect. We highly recommend taking exit 49 from HWY 85 (to Bruton Smith Blvd) and head away from Concord Mills towards the south. Look to the right side of the road and you’ll see a pumpkin display with a sign for THE GLOW right near the Hendrick auto mall. The GLOW is at the Rock City Campground. When is THE GLOW open? THE GLOW is all set up and running nightly through October 28th. Check their web site for information on the dates and hours available. Do I need tickets for THE GLOW? Yes, you need tickets for the event. They are sold for specific times or you can purchase a more flexible time ticket for an additional upcharge. You can order your tickets online here. Will my kids like THE GLOW? My girls, ages 8 & 11, really enjoyed the pumpkin display! We were very inspired to come home and carve our own jack-o-lanterns in new ways this year. The event isn’t too scary but my 8 year old felt a little uncomfortable at the beginning of the path because the mix of the creepy music, the spooky displays, and the fact we were walking in an unknown area in the pitch black night was a little much. As long as she kept close and held my hand, she was fine. Kids scared of the dark might need a little more encouragement but there was nothing gruesome or inappropriate about the event at all. 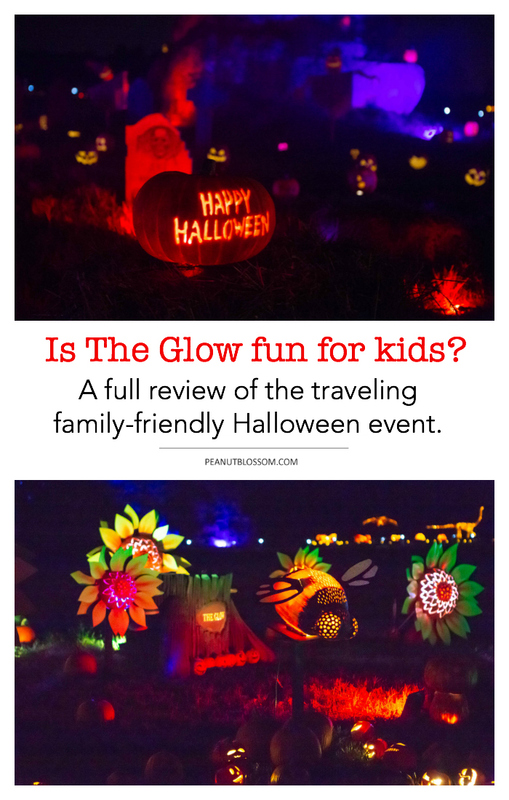 THE GLOW really is perfectly family-friendly and I think most kids will love it. Can we buy food and drinks at THE GLOW? No concessions can be taken onto the path. They offer funnel cakes and a corn dog stand at the finish of the path if you are interested. Our girls were excited for a treat, I wish we had known that it comes at the end. The line for the funnel cake was extremely long during our visit, so we actually headed over to Freddy’s for frozen custard sundaes afterwards. You can find them just a few minutes north of THE GLOW on Bruton Smith Blvd, north of Concord Mills Mall. It was nice to sit at a booth and relax a bit before heading home. The event is set up at a campground and the path is very grassy. I recommend having the kids wear closed-toe shoes to prevent an accidental stepping in a fire ant hill. Consider bug spray or pants for the kids. We had an issue with bug bites during our visit. Bring water bottles in the car. It was so hot during our visit, we would have loved a big cool drink afterwards! If your kids are tired or melting down, you won’t want to wait in line for a beverage. 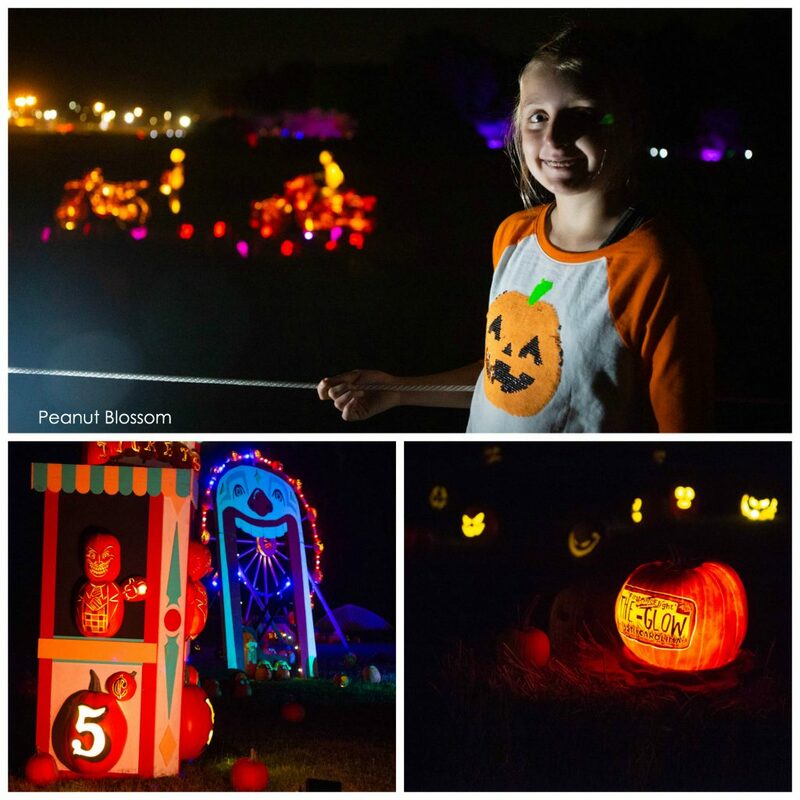 THE GLOW Charlotte features an enchanting and unforgettable wonderland of more than 5,000 hand carved, illuminated pumpkins transformed into beautiful landscapes, iconic figures and larger than life structures. 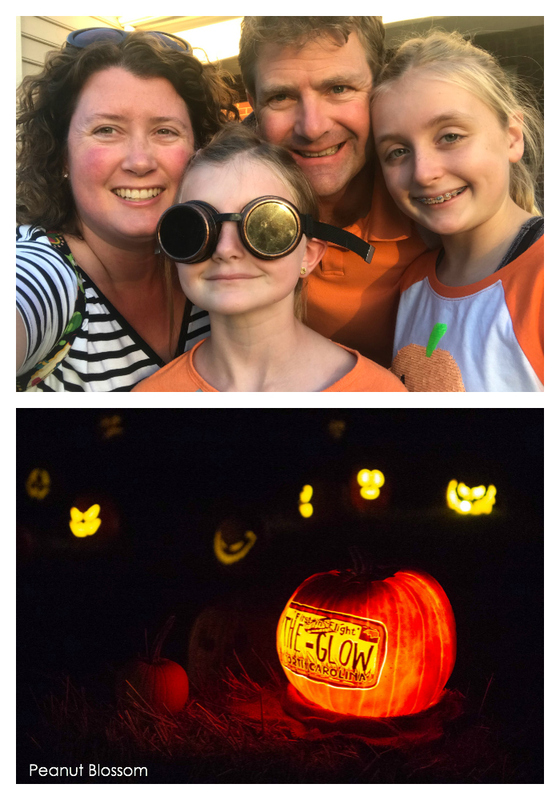 Come stroll down Jack’s Lane, a 1/3 of a mile jack o’ lantern trail where you’ll experience everything from intricately detailed single pumpkin carvings to amazing scenes created by our talented artists! THE GLOW isn’t a place to expect frights and ghouls, but you will scream with delight to see pumpkins come to life as you wander into Prehistoric Park where you’ll stare up into the golden eyes of sixteen- foot tall dinosaurs or yell ARRRGG!! as you see pumpkins crash amongst the ghostly pirate ship. Your favorite movie stars, superheroes and even some princesses come to life through the jack o’ lantern magic.